It would be churlish in the extreme to complain about the hot summer weather that has finally arrived now the Gulf Stream has buggered off to where it belongs. Its perfect timing in coinciding with the start of the school holidays has meant that the fear of having a houseful of demob happy children, rained in with nowhere to go, has not been realised. But it is bloomin’ hot; and when 8 a.m. starts, a full paddling pool and plenty of ice cream are still not enough to keep the kids cool, there is only one place to go: the woods. Sussex abounds with woodland and, in stifling heat at the height of summer, the dense canopy of trees never allows the air to warm up. Enter a forest and its benign earthiness will calm the most fevered brow. Even if sprogs and dogs insist on tearing about, nature will provide shade and still, cool air to stop them overheating. 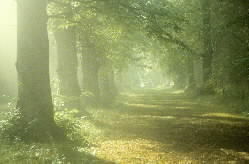 According to the latest figures, 13% of Britain’s landscape is forest and woodland. After years of decline, this is the highest it has been since the 1930s and is despite the best efforts of the coalition government and their plans to privatise the public forests of England and Wales. This policy succeeded in uniting the forces of Conservatism – the Daily Telegraph and members of genteel charities such as the National Trust and the RSPB – with more traditionally radical campaigners like the Socialist Workers Party and the Ramblers. Its hasty scrapping last year was precipitated by how many Conservatives opposed this idiot idea; but the Tories in the government had every right to be caught out by the strength of feeling from its own supporters for there has long been a contradiction in Conservatism that did not prevent the erosion of the fabric of Britain last time they were in power. The fundamental dichotomy at the heart of Conservatism – the free market and tradition – is something that has puzzled me for a long time. Slavery to the free market and deregulation means that the look of Britain has been transformed in the last thirty years: gone are the traditional liveries of our national and local public services and in their stead are the logos of a thousand faceless contractors. The free market idea that the cheapest price is best, with no regard for quality or aesthetics, delivers a world where the appearance of ‘phone boxes and buses is no longer consistent, the postman doesn’t deliver twice and water and electricity is supplied by the French (a situation, I would have thought, that fills your average Tory Europhobe with horror). If the consistency of public services has been lost, the opposite has occurred in private sector services. Business is now dominated by a limited number of huge global concerns that have ensured the virtual end of the independent sector. This has changed the face of the High Street from the variety and range of retailers thirty years ago, to the proliferation of multiples such as McDonalds and Starbucks that we have today. In her book ‘Eating Air’, Pauline Melville notes that “all the things that people feared from communism: bland uniformity, cloned cities and omnipresent surveillance have been brought about by capitalism and nobody recognises it”. It was the policies of Thatcher, Major and Blair that sacrificed the service landscape of Britain in the name of competition but perhaps the prospect of being greeted by the words “This forest is managed by Capita and sponsored by Coca Cola” has finally woken Conservatives up to their duty to conserve. Whether it is Ashdown Forest or Abbots Wood, Friston Forest or Darwell Wood, or any of the hundred smaller woods, there are plenty of dark, shady havens to choose from. There was a time when there was a lot more forest and woodland in Sussex. 1500 years ago, before clearance for agriculture and settlement, the huge wild wood forest of Anderida covered an area greater than what remains of it now, Ashdown Forest. This woodland is often cited as the reason that Sussex was the last county in England to convert to Christianity – it was cut off from the rest of England by its expanse and density. I like to think that this reluctance to give up Paganism was more down to the ‘we wunt be druv’ nature of the Sussex spirit, in existence even then; but if it’s not, shame there were not more trees. Brilliant quote from Pauline Melville, spot on truth.